Allen died in Seattle two weeks after revealing a return to treatment for the cancer he had fought into remission nine years ago. He was diagnosed with Hodgkin’s lymphoma in 1982, a disease that prompted his departure from Microsoft in 1983. One of the richest people on earth, Allen is best known for co-founding Microsoft with Bill Gates in 1975. It was Allen who inked Microsoft’s deal for Tim Paterson’s Quick and Dirty Operating System, which was ultimately delivered to IBM for use in the company’s PC products. Microsoft grew from there to become a tech industry titan. Though he officially left Microsoft’s board of directors in 2000, Allen stayed on as an advisor to Gates and held millions of shares of company stock. At the time of his death, Allen’s estimated net worth was pegged at above $20 billion. While his contributions to modern computing are substantial, Allen’s philanthropic and extracurricular endeavors far outweigh his business accomplishments. He made significant investments to fight Ebola and founded medical research institutes the Allen Institute for Brain Science, Allen Institute for Cell Science and The Paul G. Allen Frontiers Group. His investments realized Burt Rutan’s SpaceShipOne commercial aircraft, while personal initiatives Stratolaunch Systems and Vulcan Aerospace seek to reduce the cost of space travel. Allen also bought controlling interests in Charter Communications and Ticketmaster, and owned both the NFL’s Seattle Seahawks and the NBA’s Portland Trail Blazers. “Our industry has lost a pioneer and our world has lost a force for good. 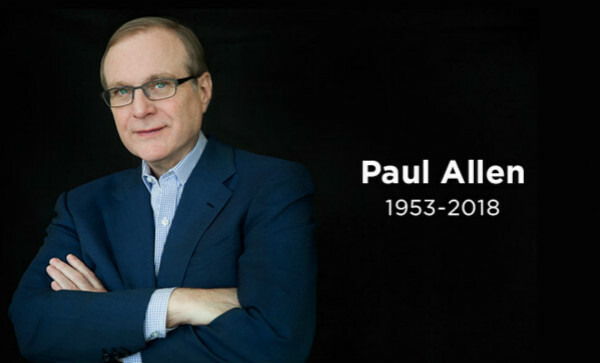 We send our deepest condolences to Paul’s friends, the Allen family and everyone at Microsoft,” Apple CEO Tim Cook said in a tweet.